Dionna and Jordan met during a biology field trip in their freshmen year at T.F. South High School in 2001. By chance, Jordan had seen her in passing but wasn't lucky enough to have class with her. Jordan knew that he had to make her friends his friends in order to meet her. Needless to say, creating an organic interaction would prove to be difficult, but, their social group took it as their responsibility to make sure the pair met. So, for a month and a half, Dionna's friends would meet Jordan at his locker and gave a rundown that usually went something like "she thinks you're cute..." or, "she said that I could give you her number..." Eventually, the fateful school trip came and with a few awkward interactions along the way, Dionna and Jordan fell in love. Sixteen years later, and these high school sweethearts are ready to start their new life as husband and wife. 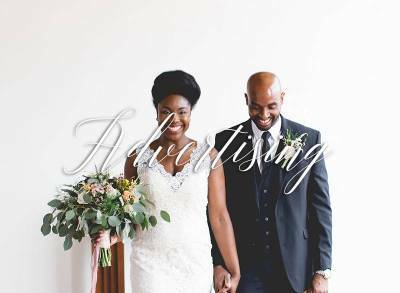 Check out Dionna and Jordan's personalized engagement session, captured by Olu Jr Photography. It was Saturday, November 19, 2016, when I asked (rather, I told) Dionna to marry me. Between the two of us, Dionna is definitely the planner in our family, but I wanted to make sure that she would have an engagement to remember forever and be happy whenever she thought of how it went. The funny thing about that Saturday is that Dionna and I had both been planning to celebrate Friendsgiving that evening. Dionna had only anticipated about 10 to 12 people to meet up with for dinner. So, while she was busy planning this nice evening for us and our friends, thinking of games to play, coordinating who was assigned which dish to bring, etcetera, I was planning a much more elaborate evening. Roughly a week and a half before Friendsgiving, I started planning to the proposal. I remember calling Dionna's youngest sister, Dannie, first to break the news about the engagement. From there, Dannie had given me just about every name and number of aunts and cousins to call and invite. From there, I called Dionna's parents and explained to them what I had planned, stressing the secrecy of the event. So, after calling a host of relatives and friends, the plan was in motion and things were set. On the morning of November 19, Dionna and I were running around to prepare for the dinner that we were hosting that evening, but I knew that Dionna would still expect brunch that day, so, I lied and told her that I had a reservation. So, as we're heading out that morning, my mind was spinning, and my stomach was in a bit of a knot. Prior to, I had arranged for Dannie to hide out at Nichol's Park, down the street from our apartment, and to be ready to hop out of the bushes and snap pictures of a surprised Dionna. So, on our way to brunch, I told Dionna that we had to make a short stop to meet my uncle, and I insisted that Dionna come inside the gym as well. As we're walking, I temporarily lost my train of thought, but, I remember getting down on one knee and proposing that Dionna marry me. She then began backing away from me and shook her head saying "no," showing signs that she was in complete shock and disbelief. Finally, after she was done blacking out, she realized what was happening and the "no" turned into a "yes, I'll marry you." That evening, we grabbed our things and headed to Friendsgiving. Dionna's face dropped at the sound of all of our family and friends screaming "Surprise!" She couldn't believe all of the people were there to celebrate our engagement! Admittedly, I didn't spend as much time with the molecular details or manicuring the fine points of the aesthetics the way that Dionna and our planner did, but I spent most of my time relying on the knowledge and wisdom of our elders. My parents, for instance, have been married for over 30 years, and it was important to me to spend as much time with them learning how to be my best self for my future wife. Every Sunday I would visit with my parents (sometimes without Dionna) and I would spend hours, after dinner, talking with my parents to learn what it means to be an honest husband. Keep in my mind, I had so much of this already figured out. Luckily, I'm not in a position to where I have to learn so many new things about my wife to be, but instead, I wanted to make sure that I had the right tools in order to commit these theories to the application of marriage. So, in short, my "behind the scenes" time was mostly spent on figuring out "us" and how to be the best man for my wife well after the wedding. Each relationship, each couple has their own special ingredient, their own "it" that makes them "tick" exclusively to the other's "tock". Our love is special because it has been tried, in so many ways. We love hard, and we love honestly. What we mean by that is, our love is special because it isn't always "pretty" and picturesque but it is always true to us. We invest in making each other, our relationship and our foundation stronger every day. Beyond the whole "do it because it'll make the other happy" rhetoric, we do things to and for each other out of the joyous smile and laughter that the other gives in return. Our love is special because in the almost 17 years that we've been together my wife to be still lights up a room, for me, to where all I see and smell is her. From the moment that I wake up in the morning, to the moment we return from work, I'm spoiled by her embrace and I can't wait to return to it whenever I'm away from it. Lastly, our love is special because we don't try to make it special. We gleefully accept the fact that it just is. When we went back to T.F. South, we took pictures at the exact location where Jordan asked, "Will you go out with me?" And all of the butterflies came back! We also went to my old locker where we would kiss in between class periods. We even got a chance to speak with faculty who remembered us as students. It was so nostalgic to go back to our high school. We originally wanted our shoot to match the theme of our wedding, "Urban Chic," but the theme ended up being, "Our Favorite Things: A Walk Down Memory Lane." We wanted to take pictures near places that meant something to us. The Hebru Brantley mural was a no-brainer because we love his work. We took pictures in front of the Violet Hour, a really cute speakeasy in Wicker Park where we've had plenty of date nights. We also snapped shots in front of our favorite donut shop, Stan's, where we've eaten too many donuts to count. Not to mention our high school, T.F. South, the place that brought us together over 17 years ago. The shoots were flirty and fun, the essence of us! We listened to music the entire time--everything from Stevie to Anita to Beyonce. We laughed and danced between every shot! Also, we couldn't help but stop inside our favorite donut shop to grab a treat after shooting outside their storefront. Dionna: We committed our hearts to one another many years ago, but we are looking forward to making that vow in front of our loved ones. I also cannot wait to see how handsome Jordan is going to look waiting for me at the altar. That, along with dancing the night away with the love of my life! We are ready to party! Jordan: I'm looking forward to seeing Dionna walk down the aisle. I imagine in that moment, for Dionna to be the epitome of black love. She's a mixture of love, grace, and beauty that's elegantly packaged, and in all of our years of being together, I know she'll bring this majestic "awe" over the entire church. Of course! Our planner, La Toya from Elle Kay Events, wouldn't have it any other way. Our wedding took place on Saturday, April 14, 2018. There were spreadsheets and journals galore!